Authentic Japanese cuisine and noodles in West L.A.
: From the décor to the bustling atmosphere to even the style of the menu (with pictures appearing alongside most dishes), Tsujita LA Artisan Noodle gives guests the feeling of being in Osaka proper and not just a part of West L.A. dubbed "Little Osaka." This friendly, unpretentious restaurant was the first U.S. outpost of a small Asian chain owned by Takahiro Tsujita. 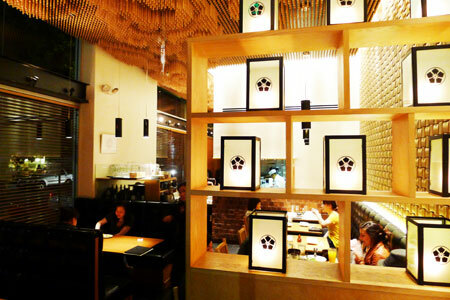 Thousands of wooden sticks hang from the ceiling and form cloud shapes above the tables and booths in the dining room. Outside, a small patio hugs the street corner. The place is famous for its tonkotsu ramen and tsukemen --- noodles served with a rich broth for dipping. The soup is simmered for 60 hours. Variations come with barbequed pork, soft boiled egg and green onion. There are also rice bowls with spicy tuna and salmon. Look for Japanese beers and saké. Tsujita LA Artisan Noodle is very popular --- and thus very busy --- so be prepared for a wait.